The WaveShare SN65HVD230 CAN Board is an accessory board that features an onboard CAN transceiver SN65HVD230, which is pinout-compatible with the PCA82C250. It is powered at 3.3VDC and features ESD protection. The SN65HVD230 CAN Board is ideal for connecting microcontrollers to a CAN Bus network. While many popular embedded systems (e.g. mbed LPC1768, Arduino Due, Teensy 3.x, etc.) provide their respective CAN interfaces, these CAN capabilities are per default useless without their respective CAN transceivers. A CAN transceiver is a line driver that converts the controller’s TTL signal to the actual CAN level, which is a differential voltage. The use of differential voltage contributes to the vast reliability of CAN. Out of cost constraints, boards like the Arduino Due and the mbed LPC1768 have no onboard CAN transceivers. Basically, CAN transceivers would add more costs to the board and why pay for it when you don't need it? CAN transceivers, due to power management requirements, come always as a separate chip. 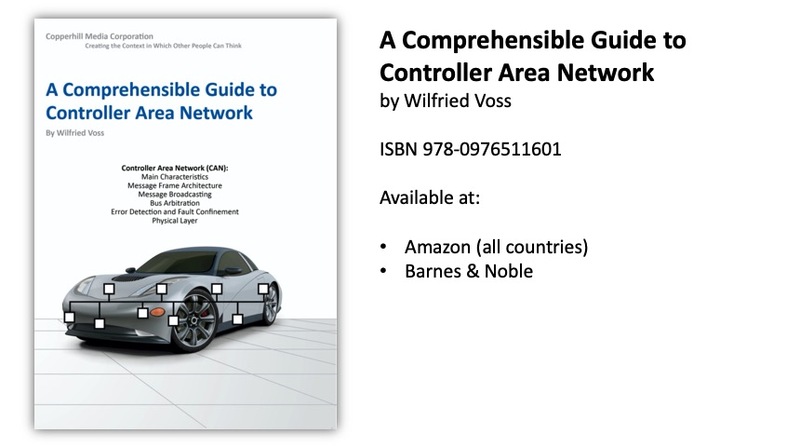 Controller Area Network (CAN) is a serial network technology that was originally designed for the automotive industry, especially for European cars, but has also become a popular bus in industrial automation as well as other applications. The CAN bus is primarily used in embedded systems, and as its name implies, is a network technology that provides fast communication among microcontrollers up to real-time requirements, eliminating the need for the much more expensive and complex technology of a Dual-Ported RAM. This book provides complete information on all CAN features and aspects combined with a high level of readability. Click the button below to add the CAN Bus Mini Breakout Board to your wish list.